(2018). "Gradient Compression Stockings for Patients". In (Eds.) , WoundReference. 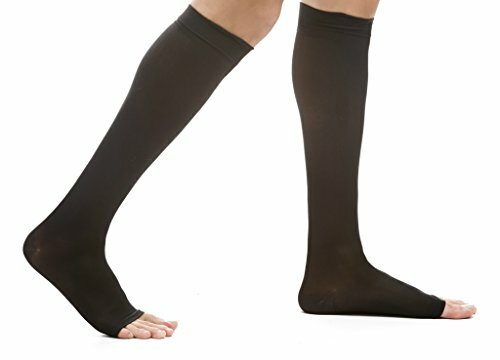 Available from: https://woundreference.com/app/topic?id=gradient-compression-stockings-for-patients. Retrieved on 4/25/19. WHAT are gradient compression stockings? Gradient compression stockings are special elastic hosiery that healthcare professionals recommend to treat or prevent certain conditions. They are usually made of different materials such as wool, spandex, nylon, silicone and latex. They have different styles (knee-high, thigh-high, pantyhose, etc), with open or closed toes, and can have 2 layers (inner and outer). For treatment or prevention of venous ulcers, generally knee-high gradient compression stockings will suffice. They come in sizes pre-determined by manufacturers or can also be customized to your body to ensure proper fit. For treatment or prevention of venous ulcers, the recommended pressure level is 30-40mmHg or above. WHY do I need to wear gradient compression stockings? Gradient compression stockings are a type of medical-grade stocking that can be used to help heal venous ulcer in patients with small, simple venous ulcers. They are a viable option if you ﻿wish to have more autonomy with dressing changes, find bandages that are traditionally used to treat venous ulcers too hot or bulky , are able to don the stockings by themselves, and do not have any contraindications to wearing gradient compression stocking . These factors should be discussed with your clinician. After a venous ulcer heals, you will need to continue to use gradient compression stockings as the underlying factors that caused it to begin with have not been addressed. If you are a good candidate for vascular surgery, some of the factors may be addressed surgically. However, if you prefer or are not able to undergo vascular surgery to correct the underlying structural causes, gradient compression stockings are a definite, life-long treatment. WHAT are the potential adverse effects related to gradient compression stockings? HOW do I wear gradient compression stockings? Put on stockings first thing in the morning before you get out of bed. Your legs have the least amount of swelling early in the morning. Hold the top of the stocking and roll it down to the heel. Put your foot into the stocking as far as you can. Put your heel in the heel of the stocking. Pull the stocking up. Unroll the stocking over your leg. After the top of the stocking is in place, smooth out any wrinkles. DO NOT let the stockings bunch up or wrinkle. If you use lotion on your legs, let it dry before you put on the stockings. Use a little baby powder or cornstarch on your legs. This may help the stockings slide up. Put on rubber dishwashing gloves. Use your hands to adjust the stocking and smooth it out. Use a special gadget called a stocking donner to slide the stocking over your foot. You can buy a donner at a medical supply company or online. Hand wash or machine (delicate cycle) wash the stockings each day with mild soap and water. Fabric softener may not be used. Rinse and air dry. If you can, have two pairs. Wear one each day. Wash and dry the other pair. WHEN do I call my clinician? You are concerned about wearing them due to any reason (e.g., cost, appearance, pain etc) and are not able to wear them as directed. Does MEDICARE cover gradient compression stockings? Only 30-40 or 40-50 mmHg below knee gradient compression stockings (HCPCS A6531 and A6532) and 30-50 mmHg below knee gradient compression wraps (A6545) are covered by Medicare part B. HOW do I take care of gradient compression stockings? Hand or machine-wash with warm water and mild soap or detergent. No chlorine bleach. Warm water rinse. Hang or lay flat to air-dry. May dry in a dryer on low heat or delicate setting. Placing your stockings in a mesh laundry bag will help protect them during the wash cycle. WHAT brands are there and WHERE should I buy them? Several brands are available. You can choose a brand that matches your needs by visiting WoundReference Product Navigator and the Gradient Compression Stocking Interactive Feature Matrix. Ti, Dongdong; Hao, Haojie; Xia, Lei; Tong, Chuan; Liu, Jiejie; Dong, Liang; Xu, Shenjun; Zhao, Yali; Liu, Huiling; Fu, Xiaobing; Han, Weidong et al. Controlled release of thymosin beta 4 using a collagen-chitosan sponge scaffold augments cutaneous wound healing and increases angiogenesis in diabetic rats with hindlimb ischemia. Tissue Engineering. Part A. 2015;volume 21(3-4):541-549.